In order to carry out item level recovery of SharePoint 2010 using System Center Data Protection Manager 2010 (DPM) you may need to update the DPM catalog. I was testing SharePoint 2010 recovery using DPM and got a shock when a site and page I setup for the testing weren’t listed as being available for recovery despite the fact I’d just created a recovery point. It turns out they had been backed up, but the DPM catalog was out of date. The steps below detail how to update the catalog. Press Enter, type $PG and press Enter again and you should see a table with two columns. Type $DS = Get-Datasource $PG[X] and press Enter. Substitute X with the number of the datasource in the list above. In my case I want to update the catalog for the “SharePoint 2010” datasource, which is third in the list, so I enter  as the list is zero based. Type $DS and press Enter. The output above shows the details for the selected datasource. I want to update the catalog for the Sharepoint Farm, so type the command below and press Enter. $DS is the value of the datasource item within the list. This list is also zero based. Allow a few minutes for the catalog to update and the items will be available for recovery. This entry was posted in Backup, System Center Data Protection Manager on October 12, 2011 by richardstk. 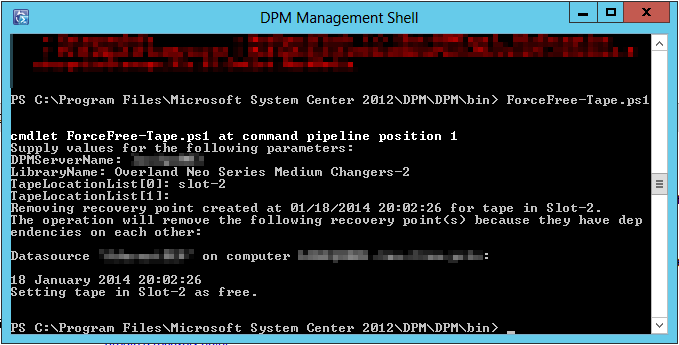 I’ve had the same problem with DPM 2012 SP1 and the registry still fix worked. This entry was posted in Backup, System Center Data Protection Manager and tagged System Center Data Protection Manager on April 18, 2011 by richardstk. I’ve just encountered the same issue using Windows Server 2012, System Center Data Protection Manager 2012 SP1 and an Overland REO 4600 VTL. As with DPM 2007, the fix is to change the tape drive driver to the generic Microsoft LTO tape driver. I’ve used System Center Data Protection Manager (DPM) since the 2007 beta, primarily for SharePoint and SQL backups. I have a primary DPM server which backs up to disk and a secondary server which backs up to disk and additionally to a Overland Storage REO 4500 iSCSI Virtual Tape Library (VTL) for long term protection. 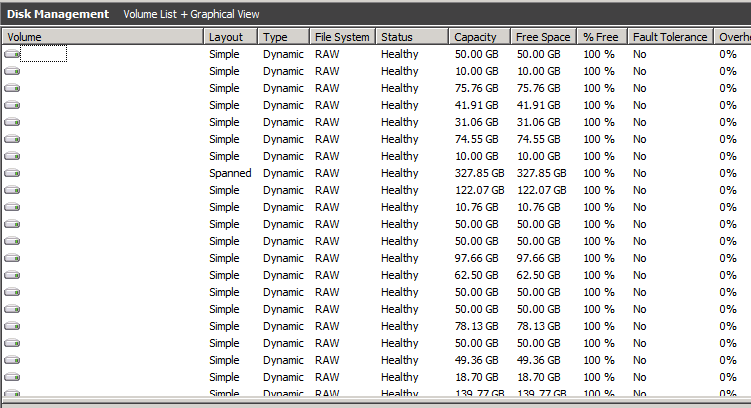 Both servers have run Windows Server 2008 R2 with DPM 2010 since its release. I’ve never had any major issues with DPM until I recently rebuilt the secondary server from scratch with a clean OS install of Windows Server 2008 R2 SP1 and DPM 2010. What I found was that although DPM installed correctly it couldn’t see the tape drives in the VTL. All the tape drives and the medium changer were visible in Device Manager and none were showing errors. The medium changer and driver were automatically installed by Windows and the tape drive driver came from Windows Update. The REO 4500 emulates an HP LTO2 tape drive and this is what was displayed in Device Manager. I followed the instructions to remap the drives here: http://technet.microsoft.com/en-us/library/bb795782.aspx. The DPMLA.xml file produced by the tool was correct, showing the correct SCSI IDs, serial numbers etc. but DPM still couldn’t see the drives. 3) Right-click and look at the properties. a) Select the Install from list or specific location (Advanvced) – next. b) Select Don’t search. I will choose the driver to install. – next. c) Uncheck the Show comtabile hardware checkbox. d) Highlight LTO under the manufacturer. e) Highlight the LTO tape drive under model – then next. f) This should install the Microsoft ltotape.sys driver. 4) Rescan the tape library in the DPM console – try to take another backup. After following the above steps, all 16 tape drives were visible in the DPM console. This entry was posted in Backup, System Center Data Protection Manager on April 12, 2011 by richardstk.